Phagocytes: white blood cells which will ingest pathogens, often displaying one of their antigens on the surface of their cells. Plasma cells: White blood cells which make antibodies, Also called B lymphocytes. Receptor site: protein on the surface of a B cell which an antigen can bind to, alerting the B cell to the presence of a pathogen. Clonal antibody selection: The formation of a large number of B-cells,all making a specific antibody against a certain antigen. For each one – write down two things that surprised you, and two things you thought were the most important to remember. The immune system is based on the principle of recognition of cells based on their surface proteins (these are often glycoproteins). The immune system divides the cells encountered into ‘self’ and ‘alien’. The other principle is that of ‘challenge’ and ‘response’. The response takes place as a result of a ‘challenge’. This challenge takes the form of an antigen present in the body (eg. 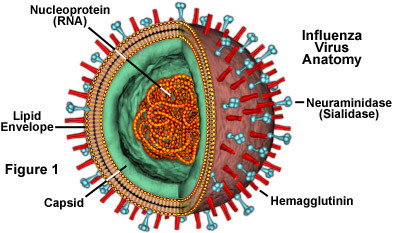 hemagglutin molecules on surface of influenza virus – the virus that causes the flu, or gripe.). 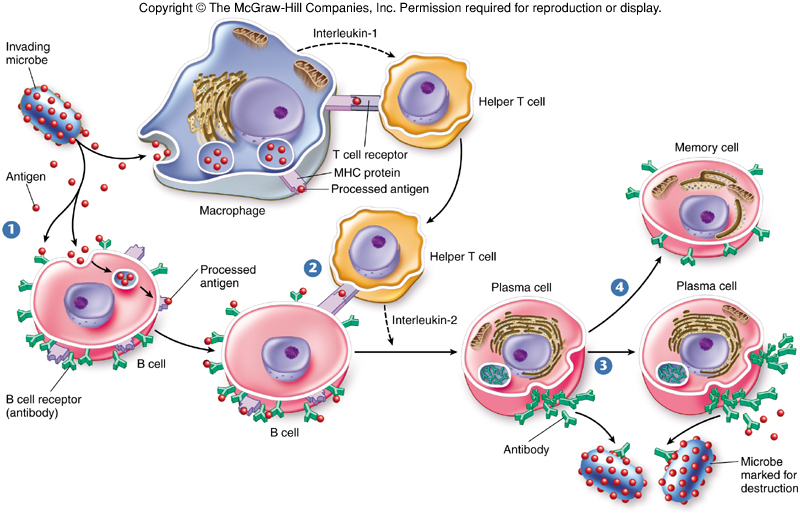 An antigen is any molecule capable of triggering an immune response. They are often described as ‘foreign proteins’ in the body. Antigens may include surface proteins of red blood cells (a cautionary detail in blood transfusions), the membrane proteins of bacteria such as E. Coli (which may be an intestinal pathogen), a component of a virus protein coat such as hemagglutinin in an influenza virus, or even a wooden splinter trapped in your finger. A normal response to a ‘challenge’ is to create antibodies which will neutralise the threat. Opsonization (attracting attention): making it easier for phagocytes to recognise pathogens and ingest them. Agglutination (sticking together): Causing the pathogens to aggregate, making them an easy target and blocking their movement. Activation of complement (open and destroy): they intertact with the cell membrane proteins, causing a complex cascade of reactions called a “membrane attack complex”, leading to a hole in the membrane through which water and ions can enter and cause the pathogen to lysis (burst). 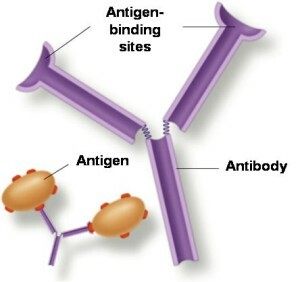 Antigen binds to a B cell receptor on a B cell. The B cell may also receive more information from a T helper cell about the presence of an antigen. T helper cells may also secrete interleukin (a cytokine, or signal molecule), which stimulates the B cell to become activated. Plasma cells can respond by dividing to form many identical plasma cells which will all secret the specific antibody required to fight that pathogen (this is clonal antibody selection). Plasma cells can also form memory cells, which will remain after the infection has cleared to provide a more rapid response in the case of re-infection. A phagocyte ingests a pathogen, and displays it’s antigen on the surface of its membrane. This is detected by T-helper cells, which share the antigen with B cells through surface docking proteins. Group A people have the antigen ‘A’ on the surface of their own red blood cells. This means that they will detect B antigens as foreign invaders and make B antibodies to combat them. Group B people have the antigen ‘B’ on the surface of their own red blood cells. This means they will detect A antigens as foreign invaders and make A antibodies to combat them. Group O people have neither ‘A’ or ‘B’ antigens on the surface of their own red blood cells. This means they will detect both A and B antigens as foreign invaders and make A or B antibodies to combat them. Since their blood has no antigens, they can donate blood to any other blood group (universal donors). Group AB people have both ‘A and ‘B’ antigens on the surface of their one red blood cells. This means that they will not detect A or B antigens as foreign invaders and will not make antibodies to combat them. Since they have both antigens, they can receive blood from any other blood group (universal donors). Lesson two: Virtual lab (Ebola). Objectives: Use the case study of the spread of the Ebola virus to apply concepts of epidemiology (the study of the spread of diseases. Pathogen: a disease causing agent eg. the Ebola virus. Epidemiology: the study of the spread of diseases. Core mutation: a mutation shared by all subsequent strains. DNA sequence: the sequence of nucleotides (eg. adenine, guanine, cytosine), which makes up the DNA or RNA. The materials will be provided in class. Essential questions: how is movement in the body produced at a cellular level? What are the roles of each tissue in enabling movement? Lesson objective: Understand how synovial joints are designed to produce certain movements. Understand the role of bones, muscles, tendons, ligaments and synovial fluid. 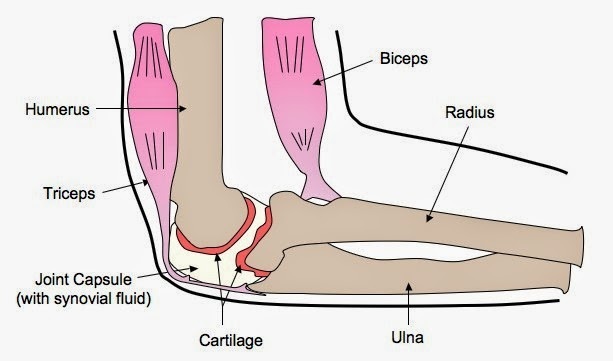 Cartilage – a connective tissue which reduces friction and absorbs physical shocks, found on the inner surfaces of bones in a synovial joint. Synovial fluid – a viscous fluid which reduces friction and increases freedom of movement in synovial joints. Antagonistic muscles – muscles that work in opposition to each other for example bicep and tricep. 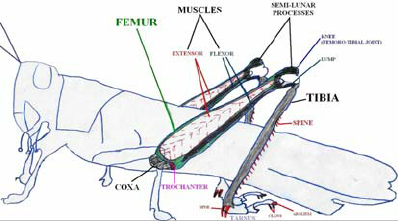 Synovial joints allow a specific range of movements. There are different kinds of synovial joints, for example ball-and-socket joints, such as the shoulder; and hinge joints, such as the elbow. Movement is produced by the action of contracting muscles, which are attached to joints by tendons. Bones anchor muscles and act as levers for muscles. Levers amplify an input force to produce a greater output force. Discussion: Which is the best and worst tissue to damage in a sporting accident – justify your response. 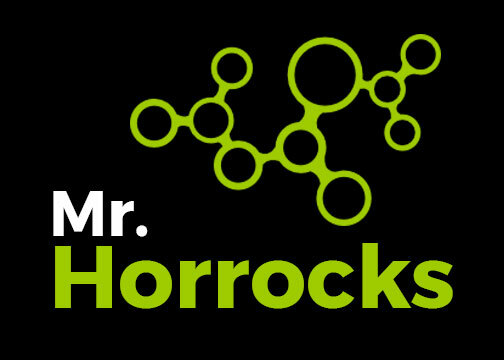 Arthritis means pain in the joints (permanent pain). The elbow joint – a synovial joint. ActivityA : Watch the tutorial and summarise the function of each part of the elbow joint in a table. the level of detail is for medical students, and so you will have to extract only what is needed for this task. How does the leg of a grasshopper compare with an elbow joint? Page 478 in the book. Does the grasshopper leg show antagonistic muscle action? What do we mean by antagonistic muscle action? What are the requirements for antagonistic muscle action? What happens to the both muscles (flexor and extensor) when the leg extends? What happens to the both muscles (flexor and extensor) when the leg contracts? Lesson objectives: Learn the different tissues that make up muscles. Understand how muscles contract at the cellular level. 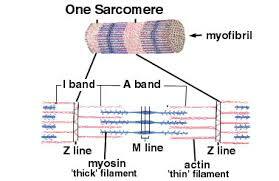 Sarcomere: the functional unit of muscle. Not called a cell because it is hard to divide striated muscle into cells. Myofibrils: an elongated structure with many nuclei and alternate light and dark bands. Sarcolemma is a single plasma membrane that surrounds each muscle fibre. There are different kinds of muscle. Striated muscle is formed from highly organised bundles of contractile myofibrils. Striated muscle includes skeletal muscle and cardiac muscle. Non-striated muscle includes smooth muscle such as that is found in the lining of the intesines. Skeletal muscle will be considered in this lesson. 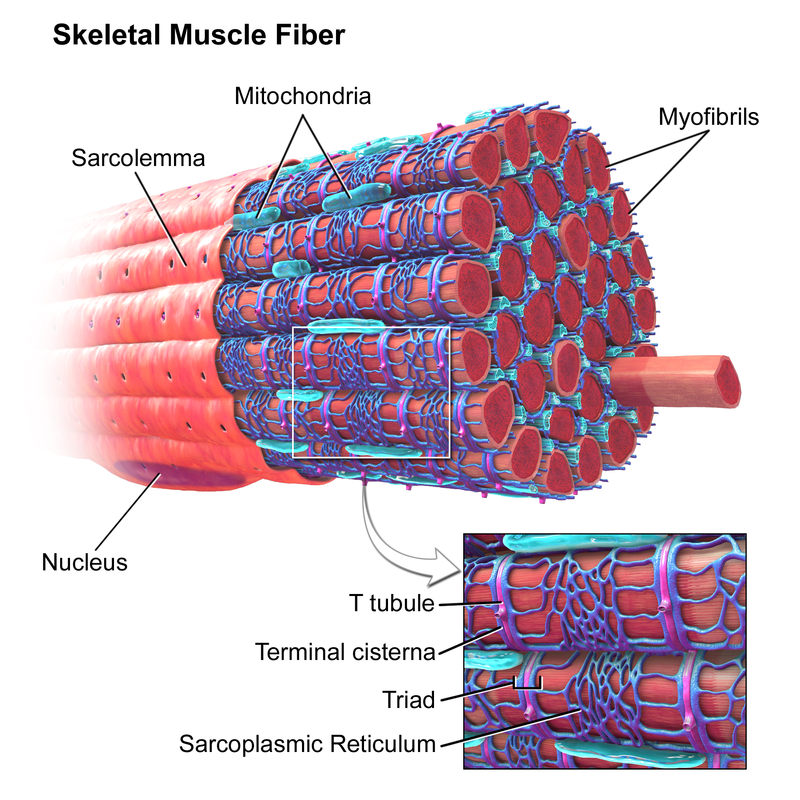 Skeletal muscle is formed from bundles of myofibrils, which are organised into muscle fibres. Muscle fibres have a membrane surrounding them called a sarcolemma. Striated muscle is not clearly divided into cells. Myofibrils are multinucleate and are made from compartments called sarcomeres (which are not considered cells as they are not clearly divided by cell membranes). Sacrcomeres have the ability to contract, because they contain specialised rods of protein that can slide past each other. These rods of protein are called actin and myosin. The Z-lines represent the boundaries between sarcomeres, and are connected to the sarcolemma (this aids in stimulation of the muscle). The light bands (I bands) represent the thinner protein actin. 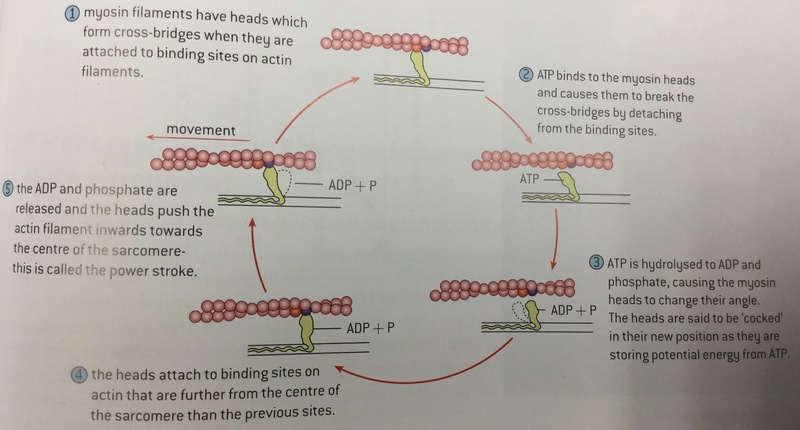 The rods of protein slide past each other in a process powered by ATP. It is the contraction of all of the component sarcomeres, which causes the bulk structure of a muscle to contract. 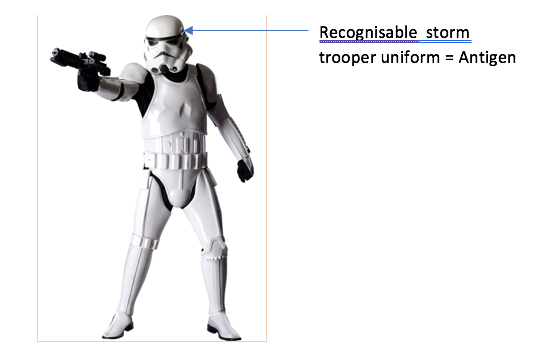 1) What happens to the A bands and the I bands during both contraction and relaxation (you may want to draw a table). 2) What is the meaning of the H zone? D Sacromere contraction happens because the sarcomere is expanding and contracting as the muscles pull it. 4) What is the specific role that ATP (an energy source) plays in the mechanism of muscle contraction? Bioluminescence: the production of light by a living organism. A jellyfish (cnidarian) called Aequorea produces a protein called Aequorin which bioluminesces when exposed to calcium. Remembering that calcium triggers muscle contractions, by injecting the muscles of the other organisms with this protein, the release of calcium can be observed because the tissue bioluminesces. Essential questions: how does the kidney regulate the concentrations of substances in the blood? What are the functions of each component of a nephron tubule? Medulla: the inner part of the kidney, this contains ducts which collect the waste products from blood. The overall purpose of the kidney is to regulate blood composition. That is achieved by excreting excess nutrients, and also excreting waste materials eg. urea. 1. ultrafiltration: filtering under high pressures, of almost all blood components (except for large proteins and cells). 2. selective reabsorption: the reabsorption by active and passive processes, of the correct amounts of nutrients. Deamination is the breakdown of excess amino acids in the liver, removing an amine group to form ammonia, and ultimately urea. This leaves behind a carbohydrate group. Urea is the main waste component of urea. Comparison of the contents of the renal artery and renal vein. 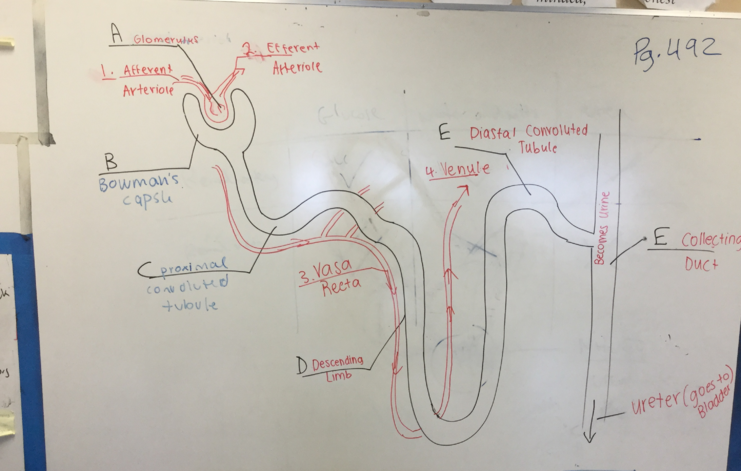 Objective: understand how the structure of a nephron allows the kidney to perform it’s functions. Bowmans capsule: the cup like head of a nephron, which receives the filtrate from ultrafiltration of blood in the glomerulus. The loop of Henle: a part of the nephron that absorbs salts and water, using a counter current system. The distal convoluted tubule: part of the nephron which changes it’s permeability to water according to the needs to the body, through the action of a hormone ADH (Anti-Diuretic Hormone). 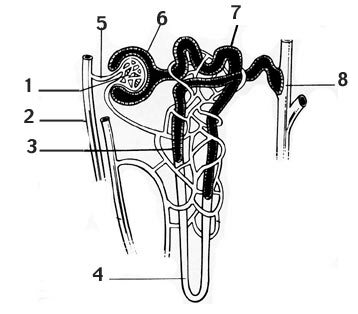 The collecting duct: the end of the nephron, which collects urine. Water is also reabsorbed in the collecting duct. Peritubular capillaries: capillaries which run received the re-absorbed substances from the convoluted tubules (proximal and distal). 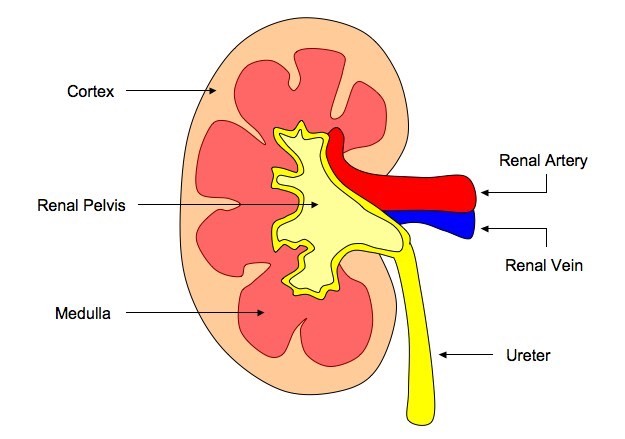 The kidney is composed of many small tubules called nephrons. A nephron carries out the functions of the kidney. 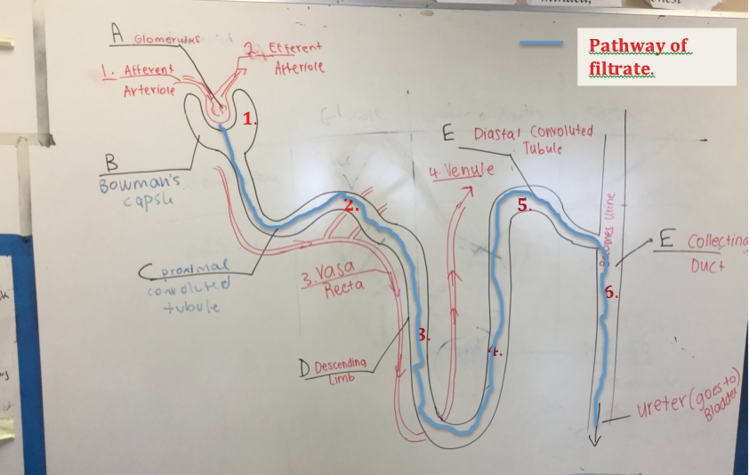 Task A: Labelling exercise: In reality the nephron twists so that the flow of fluids goes backwards in the loop of Henle (hence the term countercurrent). -A. Copy and paste the image below and label it. B. download the document (click here Labeling Exercise). 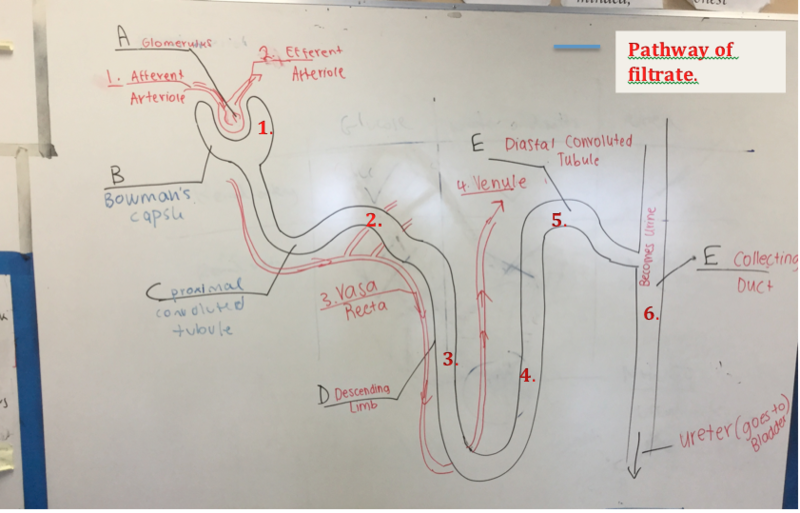 Lesson three: The flow of nutrients through the nephron. and the words: ‘the proximal convoluted tubule does most of the absorption, the loop of henle absorbs salt and water, and the distal convoluted tubule does the fine tuning’ are helpful. 3. The loop of Henle is important in absorbing water and salts. It uses a countercurrent system (the fluid flow down the descending limb, and up the ascending limb i.e. in opposite directions, hence countercurrent) to absorb first water (descending), then salts (ascending). Because of the countercurrent system, the water absorption in the descending limb happens because of the active absorption of sodium in the ascending limb. Why don’t the sodium ions pumped out of the ascending limb enter the descending limb? This would stop water absorption…The answer is the descending limb is not permeable to sodium. Why don’t the water molecules enter the ascending limb? This would work against osmotic gradients, as the interstitial fluid has a greater solute concentration. Also the ascending limb is not permeable to water. 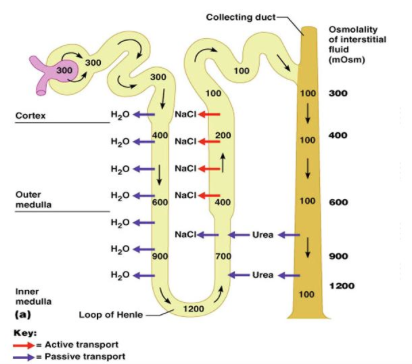 Image showing how the countercurrent system increases the osmolarity (the concentration of solutes) in the nephron. The units of osmolarity are osmoles, Osm, or milliosmoles, mOsm; 1 Osm means that there are one mole of solutes contributing to osmosis. Q) What does the countercurrent system refer to? 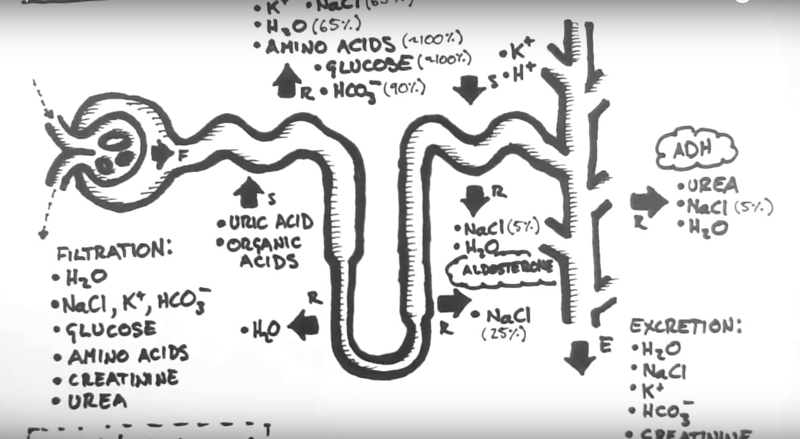 Q) What is the maximum osmolarity reached in the nephron and where? Q) Suggest why desert animals have a longer loop of Henlé? Q) Which processes of absorption are passive, and which are active in the loop of Henlé and where do they occur?